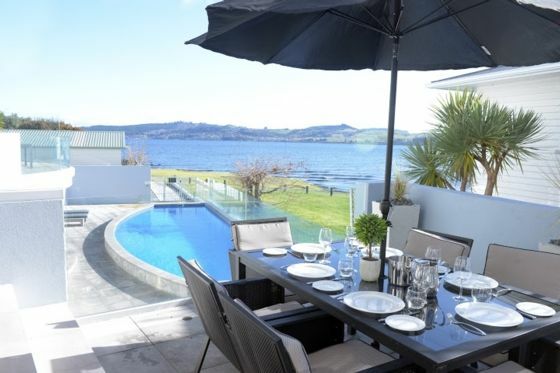 Situated right on the lake at Taupo’s very own hot water beach, Waimahana 4 is a stylish, spacious, luxury apartment with SKY TV and free WIFI. The Waimahana Apartment Complex features a Spa, Heated Pool, Sauna and Gym. This apartment has 3 bedrooms, en-suite and a separate bathroom and can sleep up to 6 guests. Spend the afternoon on the balcony taking in the spectacular lake views. This is the place to be! The apartments are accessed by SELF ENTRY. A lockbox is attached to the rear of the letterboxes. A code and instructions will be sent to you two days prior to your stay. 24 hour check in but no reception. The guest is responsible for the apartment during his/her stay. Waimahana expects the guests to take all reasonable care of the apartment and at the end of the holiday to leave the apartment clean and tidy. Smoking is not allowed inside the apartment. Maximum 6 guests. Decour starting to look a little tired. Decour starting to look a little tired. Location is perfect for walking and close to town. Easy access. Awesome location right on the lake front. Great place to stay has every thing you need, spacious and plenty of room for all great views. The apartment exceeded our expectations. The apartment exceeded our expectations. We had Apartment 2 which had an amazing view of the lake and the night lights of town. The apartment was modern, clean and very warm. Heated pool and spa were easily accessible and thoroughly enjoyed by all of us. We would definately stay here again. Excellent location. Good walk to town. Excellent cafe nearby for breakfast with amazing views and quality food.